Evaluate Energy's Asset database lets you see asset information for the whole continent quickly and easily, it is used by some of the largest companies in the industry to track opportunities, market movements and their competitors. The software is comprehensive, up to date and simple to use and provides world class data at the click of a button, ready for simple export into models, excel or corporate presentations. Quickly find out which companies operate in a region?, who owns offshore assets? Which fields have discoveries? and information on licensing rounds. 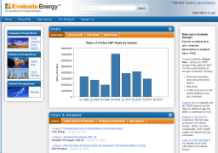 The Evaluate Energy Asset database is included as part of the Evaluate Energy subscription which also features Corporate Financials and Operating Data, Oil & Gas M&A database, Company Forecasts, National Oil Company database, Global Refinery database and over a decade worth of news all for one competitive price. Complete coverage, providing all the available information in one place. Ownership, Production, Reserves, Location and Description of every asset at the click of a button. Build powerful bespoke reports based on Company, Ownership, Asset Type, Country, Region, Production, Basin and more. Evaluate Energy provides unparalled Oil & Gas information in one place: Company Financial and Operating Data, Corporate and Asset Deals, Refining Data and News. Split Assets by Onshore Conventional, Shallow Water, Deepwater, Shale Gas, CBM, Heavy Oil, Oil Sands, LNG, Pipelines or Refining. In Algeria the Evaluate Energy African Asset Database covers fields and blocks such as Bir Rebaa North (BRN). Rhourde El Krouf (RKF) and Menzel Ledjmet North. In Cameroon Mokoko Abana is covered amongst all other blocks, In Gabon we offer production history, asset information and ownership data for Tsiengui, Tchatamba, Onal/Omko and Niungo fields and blocks. In Nigeria we have coverage for Abo, Okoro Setu, Ekanga/Zafiro and Agbara amongst others and for the Republic of Congo find quick and easy access to assets like Zatchi, Yombo, Djambala, Foukanda e Mwafi and Likouala.